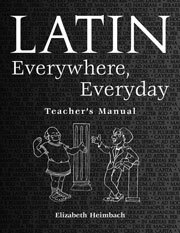 This teacher's manual to Latin Everywhere, Everyday contains the answers to all the exercises in the student workbook along with additional exercises and answers for those who have studied Latin. Some additional games and projects are also included in the teacher's manual and the accompanying CD offers a Latin pronunciation of each phrase, motto, and abbreviation. EVERYDAY HELP FOR LATIN EVERYWHERE, EVERYDAY by Vicki Wine The Teacher’s Manual for LATIN Everywhere, Everyday with the accompanying audio CD adds flexibility to use of the text in the classroom, for teachers of varying levels of experience and for a range of classroom settings. Experienced Latin teachers—won’t need help with the answers but will find having an already made answer key available, neatly corresponding to the text, a quick aid in checking or reviewing answers and spelling. In addition, sample responses supply suggestions for questions with variable answers. And sometimes there are notes (e.g., about the expressions especially easy to find in contemporary English). All teachers will especially like having the additional games and activities in Chapter 7 and extra quizzes in Chapter 8, ready to use either for planned use or as time allows. Less experienced Latin teachers—will find the above features helpful but will also like having a reference readily available as answers for discussion in class. The answers in Chapter 11 that deal with questions about case endings provide declensions of pronouns and nouns. Teachers who may be using the text to supplement English vocabulary or to introduce Latin—and who may not have as extensive a background in Latin--not only will be able to rely on the answers and have the additional quizzes and activities handy but can use the accompanying CD for help with pronunciation. The audio CD—goes through each chapter, with Jim Chochola pronouncing clearly and accurately the Latin motto or phrase and then any commonly used English variants. Teachers can use it to: ? help students practice or review pronunciation; ? learn accurate pronunciation if they are less familiar with Latin pronunciation; ? let students hear Latin spoken in someone else’s voice; ? provide dictation practice while the teacher is setting up the next part of the lesson or correcting quizzes to give back and go over immediately; ? provide a substitute with material for a lesson.